JESSICA EBELHAR/REVIEW-JOURNAL Faith Lutheran senior forward/midfielder Ryan Sniezyk, left, makes a move in a leage game at The Meadows. Sniezyk has 23 goals through seven games this season. 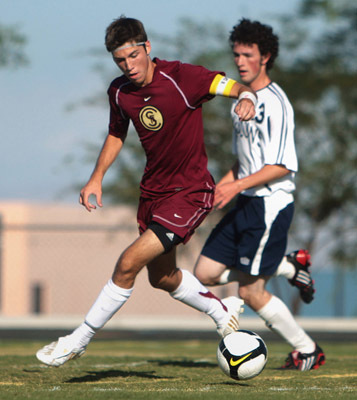 When Ryan Sniezyk’s brother, Chase, first came to Faith Lutheran, there was no boys soccer team. But after successfully petitioning to start a program, Chase Sniezyk played on the school’s first varsity squad as a junior in 2003. Five years later, Ryan Sniezyk is capping a record-setting career at Faith Lutheran in which he has helped the Crusaders become a perennial power in the Class 3A Southern League. Sniezyk, a senior forward/midfielder for Faith Lutheran (7-0, 5-0), recently became the school’s all-time leader in goals scored. He has 82 heading into the Crusaders’ home game Friday against White Pine, surpassing Jim Sullivan’s mark of 78. Sniezyk tied Sullivan’s single-season record for goals with 30 last season. And with 23 this year and seven regular-season games remaining, it appears likely Sniezyk will eclipse that record, too. Sullivan’s school assists records for a season (19) and career (46) also are in jeopardy, as Sniezyk has 15 this year and 46 overall. Though Sniezyk acknowledges he wants the records, onlookers might not know it from watching him play. He scored five goals — all in the second half — in an 8-0 win at The Meadows on Sept. 25, and Sniezyk had the same reaction after each one. He simply bowed his head and spun around to get back on defense. Faith Lutheran coach Nate Hagge complimented Sniezyk’s “maturity level and the way he handles himself on the field,” saying that is the area in which he has grown the most since his freshman season. Another key, Hagge said, is that defenders often are caught off guard when they learn Sniezyk is left-footed. “A lot of guys don’t really know at first that he can take the ball left when everybody expects you to go right,” Hagge said. Sniezyk said his biggest areas of improvement have been confidence and spotting his teammates easier. “I know where they are all the time, and that’s definitely helped me out a lot,” he said. Sniezyk plans to play at the collegiate level and hopes to catch on at UNLV. A dream for the Crusaders would be to surpass the 3A state semifinals, where they fell 2-1 last season to six-time state champion North Tahoe. Faith Lutheran was 18-2-0 last season and won all 14 of its Southern League games. This season is shaping up similarly, as the Crusaders have won their first seven games by a combined 68-1 score. “Certainly, we want nothing less than at least reaching the state tournament,” Hagge said. And as prominently as Sniezyk figures into those plans, he is hardly the only player making an impact for the Crusaders. Faith Lutheran junior goalkeeper Marc Davies has posted six shutouts, and junior forward Wade Norman has nine goals in the past five games.